To start using ExoClick ads with your videos, you will need two things. The first is a Pro license of our player - you can purchase it here. The second one is an active Publisher account on ExoClick.com. Creating such account is free and doesn't require any payment credentials. You can create one by clicking the Sign Up buttton on their website, filling out the details and selecting the Publisher account type. Afterwards just confirm the registration via the confirmation email and you can proceed to creating ads. Log into your account, go to the Publishers tab and Sites & Ad Zones under it. This is the section where you can add websites, where you want the ads to be served, and eventually create the individual ad formats (called Ad Zones) that you will implement in them. You can also edit the settings of both whenever you want. 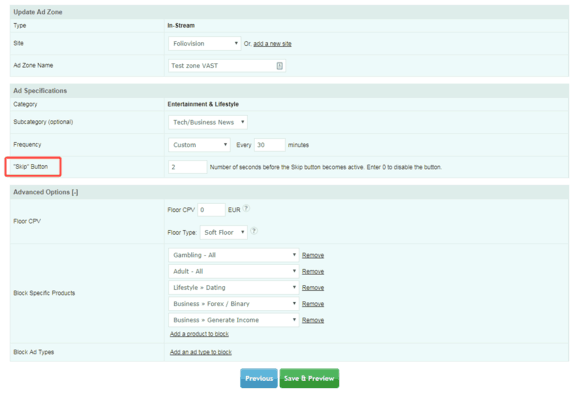 When you don't have anything set up, you will automatically be transferred to the screen where you add a new site. Fill out all the fields. The "Main Category" field has only three categories in the drop down at the moment, with Entertainment & Lifestyle being the most general of them at this moment. Selecting the category will determine the sub-categories you will be able to select in the Ad Zone settings later. You can always edit this setting. You should be in the screen Create a new Ad Zone. FV Player Pro currently supports the In-Video and In-Stream formats, that are in the Publishers section. Go to Publishers/Sites and Ad Zones and select the In-Video format in the New Ad Zone section. Then click Next. Site - the website on which the ad will be used. You can select more, if you set more than one website. Ad Zone Name - name the ad however suits you. Category - here you can see the Main Category setting of your website, which you selected earlier. Subcategory (optional) - this field will determine the content of your ads. Select the option that you want, or does fit the most to the content of your website. 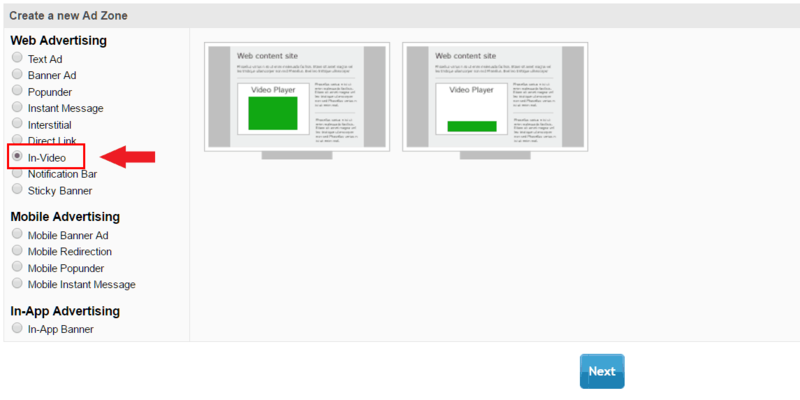 In-Video Events - here you can select when the ad will roll and what format it will have. You can pick from pre-roll, post-roll or on-pause (will appear every time the video is paused), or smaller in-stream and in-stream text ads. You can also open the Advanced Options and filter the content of the ads shown in your videos by blocking specific products or ad types. As you can see in the picture below, we don't want any adult content or ads that promote gambling, so the filters are set accordingly. After hitting Save & Preview, you will be presented with the generated script. Using this ad format requires the FV Player VAST plugin. You can find the In-Stream in Publishers/Sites and Ad Zones in the New Ad Zone section. Confirm selection with clicking Next. The settings are similar to those for the In-Video format. The most noticeable difference is that you won't select the size (it should be responsive) and time when the ad is shown (you do that in FV Player VAST settings). Most important setting is probably the Skip Button, since some devices don't support skippable non-linear ads - for instance you can't run them on iOS. When everything is set, move to the next step by clicking the Save & Preview button. Here you will get your ad tag. There are several options in the Select your video player drop-down list. 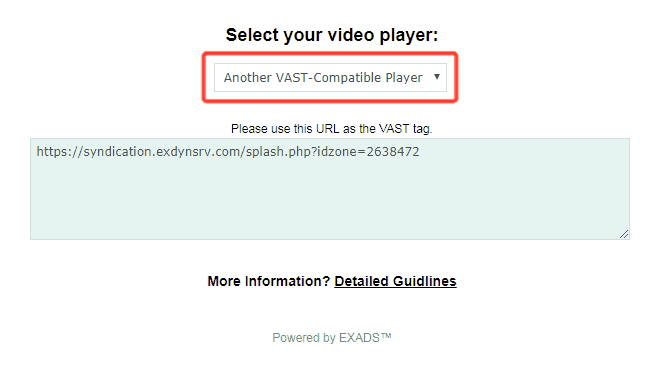 You need to select the Another VAST-Compatible Player and copy the tag to the setting of FV Player VAST (you can read more about how to use VAST and VPAID tags in this guide - How to Use FV Player VAST). To implement the script into FV Player, you will need to copy a few parts of it into the respective fields in the player's settings. Go to Settings -> FV Player Pro -> Actions tab -> Exoclick Ads (Pro) and fill out the data with the values from the script and then click Save All Changes. Exoclick category ID - "cat"
Exoclick zone ID - "idzone"
Exoclick site ID - "idsite"
After you have correctly set the values, you will immediately be able to see the ads on all your videos. The ad won't load every time since the ad container might be empty - that's due to the ad server settings. Read more in the ExoClick FAQ.